Our Coaster Call power supply for the United Kingdom is a very powerful and robust device suitable for all models which is RoHS and CE approved. It has a minimum of 3 Amps output so can easily power many Coaster Call pagers. This power supply is exclusive to LRS UK and any other power supply may well damage your equipment. Because this UK power supply is original equipment and MUST be used to ensure your Long Range Systems Coaster Call paging system is going to be fully operational and with warranty. Any other power supply will immediately void all warranty. 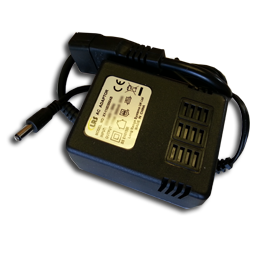 The LRS UK Power supply for Coaster Call is the only power supply you should use on your Coaster Call pagers. Our CS7 series of coaster call now can acknowledge receipt of a message and reply to the transmitter for unparalleled communications and is unique to LRS. Its a very robust unit that can work up to 72 hours from one charge. Comes in red, green, blue, multicoloured and white. The coaster call with a twist! similar to our original coaster call but has a 4 line TEXT area which can be used to send messages to customers or guests. Rechargeable and very robust. Handles up to 15 coaster call pagers. But you then simply link together two chargers. Low cost. The power is then shared to another 15 coaster call pagers. many power supplies in the UK are not approved properly. They are often cheaper in price (and usually in quality) and could be classed in some cases as dangerous. However, our power supplies are ALL RoHS and CE approved and we have the laboratory test documents as well as the CE approval documents. If you buy alternative systems it's important that you check for equipment that is not fully tested. It could save lives!